Goals from Tomas Dunne and Garrett Sinnott send Wexford champions to the promised land at the seventh time of asking. An ecstatic Rory Jacob greets the final whistle. OULART-THE BALLAGH’S AIB Leinster club hurling final heartache is finally over after capturing a maiden title at Carlow’s Netwatch Cullen Park. Goals either side of the half-time break from Tomas Dunne and Garrett Sinnott helped secure the breakthrough success after a series of high profile final failures. The Wexford champions lost all four finals between 2010 and 2013 including one to rank outsiders Mount Leinster Rangers of Carlow two years ago. Ironically, Frank Flannery’s Oulart came into this game as underdogs themselves and thrived on that position to effectively seal victory by the three quarter mark. They were 1-7 to 0-2 up at half-time and when Sinnott capitalised on a goalkeeper error for Oulart’s second goal in the 44th minute they led by 12. Cuala finally conjured their best form after that and David Treacy finished with 10 points overall but they’d simply left themselves too much to do. All of Oulart’s big guns stood up for them in testing, windy conditions with David Redmond and ex-Wexford attacker Des Mythen performing superbly. Oulart played with the strong first-half wind and were 0-7 to 0-2 up before Dunne’s goal when he fired in from close range after a probing Redmond run. Kirwan and Dunne again pointed after the restart to put them 1-9 to 0-2 clear. Cuala had the wind advantage but were well below their best and went 25 minutes at one stage without a score. They gifted Oulart a second goal too when goalkeeper Sean Brennan spilled a long free, allowing Sinnott to nip in and kick the ball to the net. Cuala did outscore Oulart by nine points to three from there on but they needed at least one goal and it never arrived as Oulart held on for a February 6 All-Ireland semi-final tie with Munster and Limerick champions Na Piarsaigh. Scorers for Oulart-The Ballagh: Nicky Kirwan 0-5 (0-3f, 0-1 65), Tomas Dunne 1-1, Tommy Storey 0-3, Garrett Sinnott 1-0, Des Mythen 0-2, David Redmond and Eoin Moore 0-1 each. Email “Bridesmaids no more! Oulart-The Ballagh finally get their hands on Leinster hurling title”. Feedback on “Bridesmaids no more! 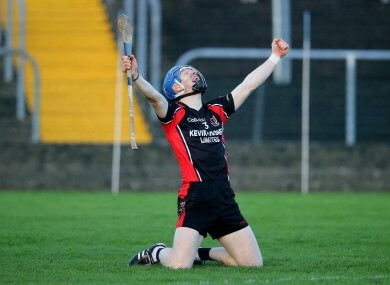 Oulart-The Ballagh finally get their hands on Leinster hurling title”.